When I gave birth to Henry, I admit that I had no idea on how to take care of a baby. I grew up without a mother so, I had no one to pattern my child-rearing skills with. Thus I turned to books and the internet to find out about what I needed to know on how to bring up a child. I had to google what type of activities and what toys to give him that are right for his development. Afterall, learning starts at home. 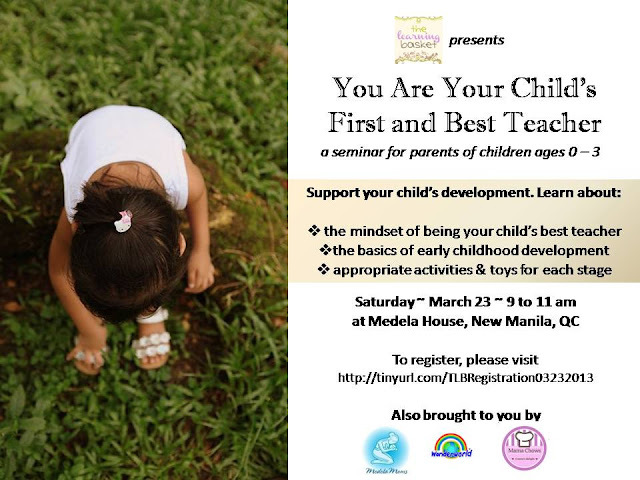 Mommy Mariel of The Learning Basket is a believer that the parents are their child's first and best teacher. Thus she has organized a seminar for new parents to bring out the best that they can be to become their child's first and best teacher and support their child's development. Why do I think that this seminar is a great idea? Well, why not? Like I said, when I was a new mom I was alway on the internet researching. Sadly, this made me spend more time on the internet than actually focusing on my child which I now realized. "You Are Your Child's First and Best Teacher" is for parents of children ages 0 to 3. It's perfect for first time parents who may not yet be confident in their parenting skills and who want to connect with other parents. It aims to help parents support their children's development by exploring the mindset of being the first and best teacher, discussing the basics of child development, and providing examples and ideas of appropriate activities for each developmental level. It would be a good venue to share experiences and connect with other parents. Mariel Uyquiengco is mother of two “littles”, a Kindermusik educator, children’s books lover, and an advocate of the idea that parents are their children’s first and best teacher. She is the mom behind the famous homeschooling blog, The Learning Basket. Registration is P250 but will be waived if parents buy a minimum of P500 worth of books or toys from The Learning Basket's booth during the event, to encourage participants to add to their children's library/educational materials. If you are interested, you can sign up HERE.